Clarington's real estate market has cooled off since the hottest spring market in many years with an average residential price gain of 7.9% over June of last year. The recent spike in inventory appears to be helping in reducing the impact of bidding wars. Properties sold in June still averaged more than asking, but the market is much more balanced than in the spring, where the bidding war was the defacto standard. The Toronto Real Estate Board's (TREB) latest market stats put the average property selling at $533,820 - up from last year's 494,921. 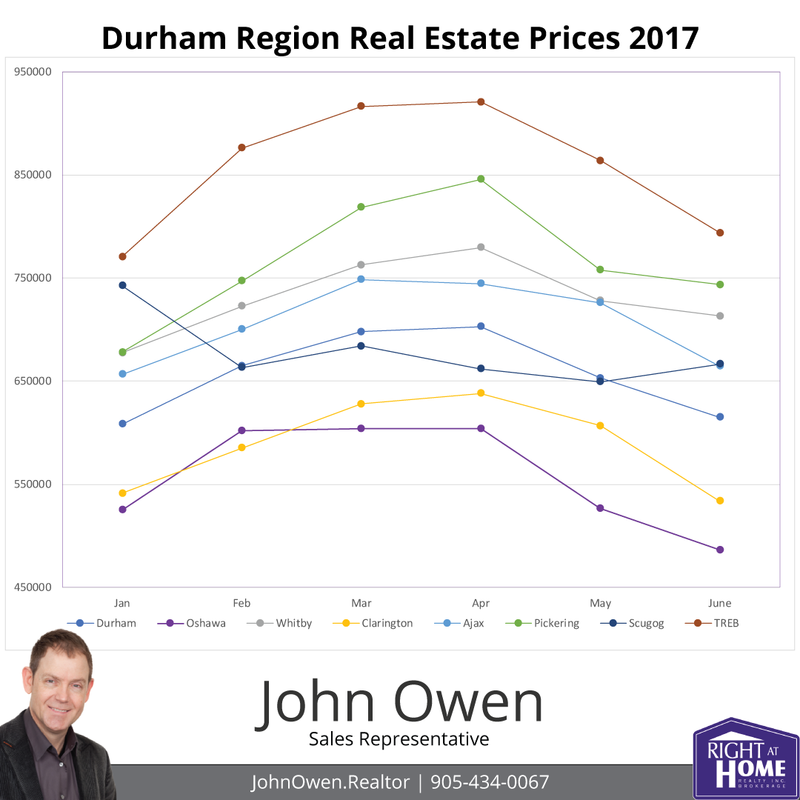 Normally, an increase of this size would be considered very good, but compared to increases in April, and the fact that prices in Clarington dropped from an average of $638,252 in April, there is certainly a justified concern among sellers that price pressure is on the downswing. Of course, that pendulum swing makes things more attractive for buyers that have been frustrated by the bidding madness, or that have been sitting on the sidelines waiting for things to calm down. The summer is looking very good for buyers now that inventories are building up and prices are stabilizing. The average selling price of homes in the GTA this June was $793,915. This represents a 6.3% increase over 2016. Sales volume was down sharply at -37.7% and new listings jumped 15.9% from last year. Active listings also increased - by 59.6%, which shows that inventory levels are recovering strongly. Compared to previous periods, this is good news for buyers with the supply starting to catch up to demand. The MLS Home Price Index helps to normalize the statistics, by adjusting sales statistics to represent typical homes within MLS areas. 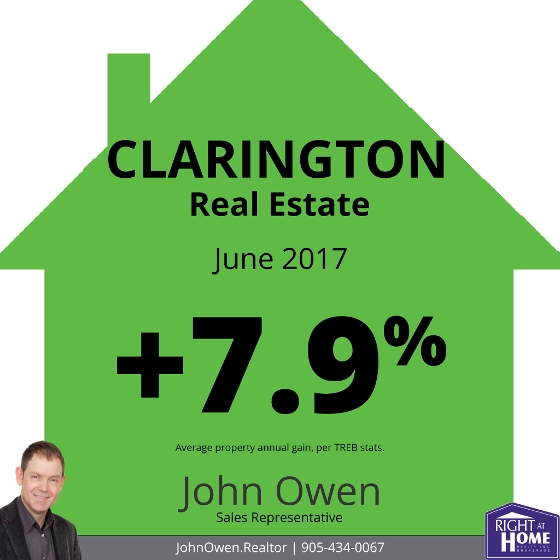 When using these numbers, Clarington showed a composite annual gain of 27.91%, compared to the TREB average of 25.33%. Inventory levels continue at very low levels with 1.2 months of inventory on hand across the board. This means that a current sales levels, all of the property would be bought up in the GTA in 1.2 months (if no new listings were added). Many areas within the GTA have similar figures, but unsurprisingly to those who read my reports, Durham Region still has the lowest inventory in the entire area. Overall, there is only 0.9 months inventory in the area. In Clarington, there is just 0.9 months inventory. Some home prices and types are still experiencing bidding wars. 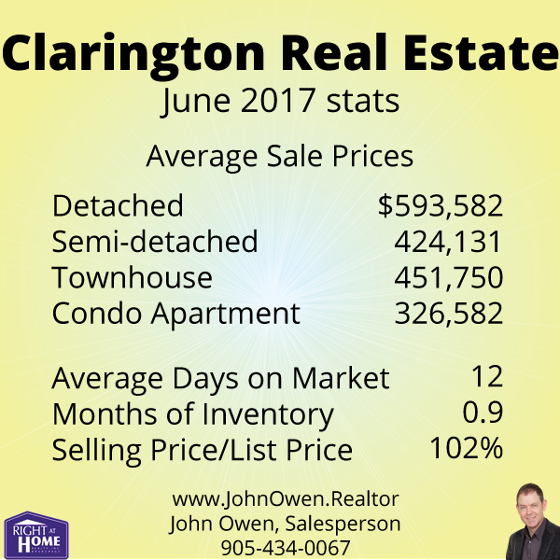 The average listing in Clarington spent 12 days on the market. The TREB average was 15 days. The average listing sold for 102% of asking, demonstrating that demand is still strong, and an indication of multiple offers on many listings, though not as many as earlier this year.